Any Korean film fan, Indiewire reader or Kickstarter funder who doesn’t already know about Yoon Jung Lee, all I can say is… I guess your internet has been offline for weeks! But now that you’ve found her, I hope you too find the below interview with yours truly of some help. It is rather informative and on many levels. With Yoon Jung Lee’s wealth of experience in the film industry and her expertise as a visual artist, it’s clear to see how she managed to create such an ingenious 25 minute film version of the one and only “Remember O Goddess (나를 잊지 말아요)”. That said, it’s soon to become no longer just that ‘one and only’. You see, thanks to her acquaintances in the fields of work by which she lives, her friends and most of all ‘strangers’ Yoon Jung Lee is beginning work on the full feature length version of “Remember O Goddess”. Although this film is not the first one she has worked on before – [the well known “The Good, The Bad, The Weird” by director Jee-woon Kim and “My Sweet, Yet Brutal Sweetheart”, a film by Jae-gon Son] – it is Yoon Jung Lee’s first full feature film as director. Plus, it’s hardly surprising to see the amount of faith people have in this woman… Just look at her resume of short films [including musical film “O Sweet Virgin”], her love of experimental film and even as projection designer for a theatre performance of the brilliant “Closer”. There’s little doubt that due to all this experience and knowledge & even love of all things musical, how she managed to answer so many questions indepthly, as well as ask other people involved with “Remember O Goddess” to join in with the questions asked. So, like Jungtae Kim’s role and story in the film & it’s transition from an extended short into the full length version, I hope this interview helps unravel a lot about Yoon Jung Lee’s character too. MMM: How did you go about casting for Remember O Goddess? YJL: I was looking for an actor who could create and control the unique tone of the movie. Within the past two years, Jungtae Kim played several comic roles, but when I thought of him for the role two years ago, he was the guy who played strong bad guys in many films. I loved that his lack of expression expressed a lot. And I thought that he should have not been limited to those villain roles because he had a great potential as a lead actor, and he could be very appealing to female audiences. So I searched for his contact and sent him the script. Until then, he had not appeared in any independent film or short film, so I didn’t expect a lot. But surprisingly he accepted the role as soon as he read the script, since the character was unlike the roles that he had played earlier. MMM: I imagine you have always been a fan of film noir. Do you have any favourite film noirs from years gone by, either form South Korea or elsewhere? YJL: Yes, I have a long list of my favorite film noirs, but I’ll make it short here. My first love for film noir was the Hong Kong noirs such as the series of Better Luck Tomorrow. I literally saw every single Hong Kong noir film available at the local video shops when I was a low-teen – my older brother rented them for me. Don’t ask me how an 11-year-old girl could relate herself to those gangster movies that exploited lots of gunshots and tons of masochistic proverbs. But I’m sure that I was not the only one. Since I have seen the same movies over and over, I still remember many important scenes shot by shot — I didn’t have any idea of “shot” at that time, but I could remember the order of the shots very vividly because strong juxtaposes of shots were the strength of Hong Kong noir. A few years later, when I began to watch films more seriously, I fell in love with the American film noirs such as Chinatown and Double Indemnity, the so called “hard-boiled,” which were unlike Hong Kong noir. I loved how the unspoken words of the film spoke to the audience in those films. I also liked Kitano Takeshi’s films such as Hanabi and Sonatine, which were not exactly film noir, but I found them very noirish. MMM: Still keeping on the subject of the film and it’s main genre, I understand that “Remember O Goddess” is completely your idea, and indeed from an idea you had several years ago. I wondered, is there a specific director whom you were influenced by regarding the genre ‘film noir’? YJL: I guess I answered a part of this question above. The original story of Remember O Goddess, which I wrote 17 years ago, didn’t have the noirish atmosphere. It was rather romantic. When I rewrote the screenplay, I added the police station scene, which could be recognized as a typical opening of a film noir, and shaped the music and cinematography to signalize the genre. Yet, I cannot choose one specific director’s name regarding the influence of the genre. But of course, I was influenced by all the film noir directors that I admired and respected. MMM: At almost exactly one minute into the film and after we’ve watched parts of a journey from inside a vehicle, we are shown, from inside that automobile, Kim Jung-tae’s character approach a police station. It’s half-revealled that this car belongs to a woman through a later phonecall with Kim Jung-tae’s character. I’m presuming she, whomever she is is following him throughout. But – and you don’t need to answer this, if you feel there are parts which must remain secret – there is a (deliberately) confusing part when a gentleman’s voice is heard allegedly mistaking him for a restaurant or takeaway company. That male voice is clearly not that same woman. Will this be one of the few things revealed in the longer version of the film? YJL: Yes, the women who appear but are not fully introduced in the short version will tell their stories in the feature version. But let’s keep the mystery unsolved at this moment. MMM: Almost on the subject of ‘noir’ again, I noticed that one or two scenes look almost black and white [or ‘noir and white’, if you like]. For example, the trainer and shoe shot as the blackly dressed Kim Jung-tae steps into the convenience store – Was that intensional or just my unique or strange vision? YJL: We didn’t have decent enough budget to spend on art design, but we did try to make the film look like a film noir with what we had. The main character’s costume is intentionally black and white, so the two scenes that you mention look ‘noir and white’ accordingly. Also, in the several scenes when he was in the apartment, we shot him through a glass reflecting the outer world so that he would look like being displayed in a show-window, making a contemporary visual comment on the old-time psychological theme of the genre – claustrophobia. MMM: Again, this could be just my take on the film’s look, but I liked the green tainting in the first interior scene, the police station. What was the reason for this, if any? YJL: First of all, the location had many greenish lights — and we liked it since those lights made Jung-tae’s skin look pale and dry. MMM: I love the film’s titles & title, by which I’m referring in particular to the actual format of Remember O Goddess [or should I say “Sseddog O Rebmemer? ; ) ] Both in Hangul and English it’s written backwards and so is the line separating the two languages [the line very appropriately named ‘back’slash] enhances the meaning further… In other words, the writing is representative of his search ‘backwards’ in time to find who he is. Am I right in assuming that is the reason? Furthermore, who’s design and idea was this? 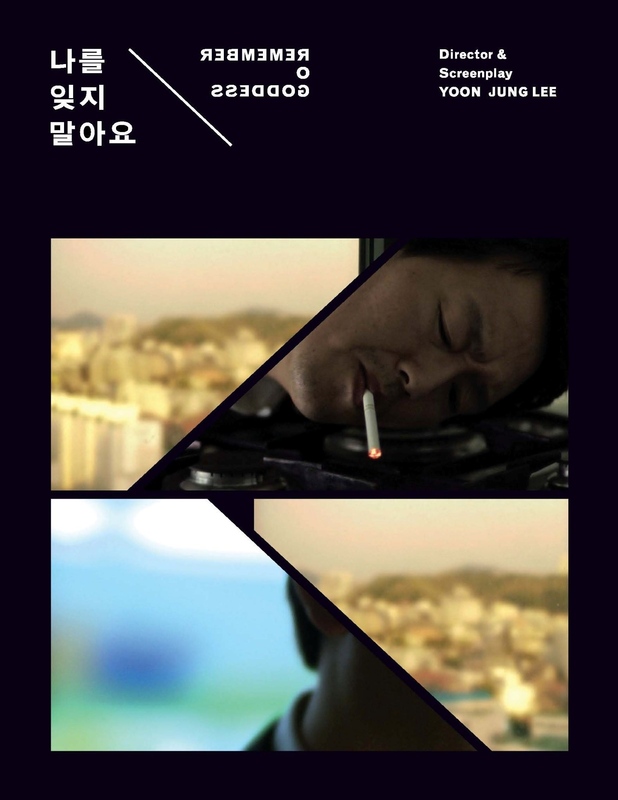 YJL: The title was done by Mr. Jones Association, a rising design studio run by my friend Jiseok Kim and his colleagues. We didn’t dig in to the meaning of the design during the discussion for the title. I instantly liked it when Jiseok came up with the idea. But I guess the creator of the design must have something to say. JK: That is a very interesting question – and it seems that you got pretty much everything right. I’m not sure if I can do it better but here is my attempt . . .
b) It turned out that this limitation could be a good starting point; How can we take advantage of this unusual situation? c) Then I realized there are many “unrevealed” things in the movie. Of course you see many things, getting to know about the man a little bit but, at the end, there are many things left unexplained. d) That’s why I made the title in this way; all words / letters were fragmented, only appearing piece by piece, and even when the full title is shown, you can’t read the other side since one of them is always written backwards. e) Lastly, it’s supposed to be a mystery. So I’d better not say anymore. MMM: On the subject of that ‘backwards’ storyline, have you seen “Memento” by Christopher Nolan? YJL: Sure, I saw the film when it was released, and I have seen it several more times since then. I even looked at it again as a reference for another script that I’ve been working on. I was looking for the “acceptability of ‘memory-loss’ plot” of the movie. Since my film was not going backwards continuously like “Memento,” I didn’t pay attention to that part very much when I saw it again recently. But I found the backwards storyline very interesting when the movie first came out. MMM: Can you tell us a little bit about the music in “Remember O Goddess”? Personally, I love it and partly because it shows us very different styles – for example, at the beginning it starts quirkily and a little mysterious, I’d say and later melancholic & sort of romantic or sad? Did you give a vague instruction to Junick Hwang (a.k.a. Missing Island)? YJL: The movie begins as a film noir and ends as a (tragic) love story, so I wanted to shape the film’s genre through the music throughout the film. I made an audio script with the selection of music edited on top of the recorded dialogue and scene description, so my musical director would be able to understand when and what kind of music I needed for the film. But Junick might have something more interesting to say . . .
JH: A week… I had only a week to finish everything for the film’s music. Yoon Jung was doing the post-production and had to go back to Philadelphia very soon. I was in Seoul for a short visit while I mainly stayed in NYC for my graduate study in jazz-piano. Back then, we were some strange travellers who flied back and forth from the US to Korea or vice versa. Since my macbook was the only equipment that I brought to Seoul, I had to create the whole music only with Logic — a sequencing application for mac — and plug-in instruments. Furthermore, I was (and am) a singer-songwriter who plays piano, not a professional film composer. No matter what circumstances we were in, we didn’t have time. No time for worries. Since we were extremely busy for our own works, we exchanged the directions and the results through email. I downloaded the rough cut, cut the parts where the music will be added on, and launched them on Logic. The first scene that needed music was the street at night. Yoon Jung asked me to express the isolating and disconnecting mood of the mordern city. I thought about the lonely street and the man who had lost his memory. This could be the story of all of us. I made several musical pieces with similar chord progression but three different rhythms. I sent them by email, and the third one was chosen. I personally liked the first most, but it was rejected. I’d love to use the music for another piece of film in the future. Then I made the music very quickly with no concern for the order of the film. I think that the film’s mood is created mainly by the tunes that play on top of the title and the scenes when the man writes a letter. My favorite part is when the man wonders around the street searching for the girl from the convenience store. The music expresses the man’s sadness and confusion. I wish the scene lasted longer so the music also could stay longer. The most difficult challenge was the scene when the man comes out of his apartment and tries to steal the newspaper from next-door. Yoon Jung wanted me to express the light and funny movements, but I didn’t understand what it meant and how I could do it — I guess I was not a great film-composer. Speaking of the melancholic and sad music of the later part of the film, I just followed the film’s natural arch. When I made the music for the ending title at the end of the process, I became melancholic myself for some reason. I can’t explain why. I hope I can rearrange the ending music classically and re-record it with the real intruments in the future. MMM: Comedy plays quite a big part in the film. Do you think this is important in most films, however hard-hitting their subject matter may be? With future projects will you continue to inject some humour, whatever the story? YJL: I don’t think that every film has to keep the comic atmosphere. It’s just one choice among other choices that I made for this film. I think the comic moments in films can make the distance between the audience and the characters closer quickly. Then filmmakers can easily start to tell the real story that he/she wants to evoke through the characters. Apart from this functional reason, I guess the comedy/tragedy balance of my films reflects my personality. I may be a serious person but I can’t stand heavily serious moments in real life — I enjoy watching super serious movies, though. So it’s been a continuous tendency in my films and scripts since I started to write stories and make films. I guess it’ll continue for a while or longer. MMM: Sae Kyoung Moon is your editor on “Remember O Goddess” and, of course she did the same on “Mother (Madeo / 마더)” – It’s a little ironic that your film has connections with a character’s mother, but what I want to ask is whether you indeed enjoyed “Mother” ? YJL: Sure, I loved Mother. Mother was made in the same company that I worked at for The Good, The Bad, The Weird, so I had many friends who worked for the film. I was invited to the VIP screening when the film was released, and I instantly knew that the film would become an important film in the history of Korean cinema. MMM: In general, who would you say are your main influences in your career? YJL: I can’t choose one name. The wonderful filmmakers/professors from CalArts such as James Benning and Betzy Bromberg are my huge supporters. I respect them so much, and I know that they believe in me as a filmmaker. However, speaking of a role-model, I don’t have any. I just can’t understand how other people can choose a role-model while everyone is going for a different goal of one’s own. MMM: Your current home… Why Philadelphia? I thought it may be from where you did your later studying, but that was in California. How did you end up in ‘Philly’? YJL: My husband got a job at Upenn in Philadelphia, which was a great opportunity for him. At that moment, I kinda missed life in the US, so I agreed to move to Philly. MMM: On average, how many times a year do you return to Seoul or South Korea in general? YJL: Twice or three times, perhaps. Flight tickets are so expensive that I cannot go back more often. MMM: As I’ve spoken of both the US and SK, where else in the world have you visited and have you been to the UK at all? YJL: I’ve visited London and Salisbury in 2003. I loved the cultural experience in London and the beauty of the village and landscape in Salisbury. I hope I can visit the UK again in the future, maybe for the screening of Remember O Goddess. Other than the US, the UK, and Korea, I’ve been to Italy, France, Belgium, Nethelands, Canada, Singapore, China, Thailand and Japan. MMM: Sticking with the subject of the UK, The Korean Cultural Centre (London branch) recently celebrated it’s 100th film screening with a film by Song Il-gon, “Always” [‘Only You‘ / Ohjik Geudaeman / 오직그대만)”. One of his earlier films was developed from a short (30 min) of the same name, “Feathers in the Wind (Git / 깃)”. Although this expanded film was under different circumstances to your “Remember O Goddess”, are you someone who likes his work? YJL: Yes, I like his works. I especially liked his short film Picnic (소풍) which won an award at Cannes, and was probably the first Cannes awarded Korean film… Don’t believe my memory on the records or statistics, though. MMM: Lastly, you chose to obtain funding for “Remember O Goddess” through Kickstarter. This is said to be the most popular of the crowdfunding sites around [I know of a couple of large ones, namely Sponsume and IndieGoGo], so is that why you chose it or did someone you know recommend it from experience? In fact, had perhaps a friend suggested crowdfunding in general? YJL: Yes, several friends of mine recommended me to try crowdfunding since they knew that I was looking for funds to finish Remember O Goddess. Crowdfunding had been almost fully established in the US by last year, so every filmmaker who I met here talked about it. MMM: Thank you for your time and thorough responses, Yoon Jung. Junick Hwang and Jiseok Kim… for their much appreciated time. With that interview over and indeed the ‘Kickstarter’ campaign recently drawn to a close too – very successfully, I must add – it just leaves me to give out further information about the project itself. Firstly, although that particular campaign is over it’s now really just the ‘beginning of the beginning’ for Yoon Jung & co. as they embark on the giant job ahead of them. This job can also be helped further by anyone out there. Yes, you too can help contribute towards ‘making the film’ – as indeed I did previously. If you think that this sounds like one mean feat for someone to still contribute – especially as most people know that movie making can be a hugely expensive task to undertake – you may not think so when I explain that EVERY PERSON who contributes will be assisting to achieve payment to actors and crew [currently they are doing it for nothing, only love!] as well as improved quality to the image and/or sound. To be a backer it starts from only $1 (that’s just around 60p for those in the UK)…! Now, I say that putting a film together is a hugely expensive task but, of course really it’s a combination of thousands of tasks, most which seem little but are largely valuable to the finished product. On the above sites you’ll find videos from not only Yoon Jung Lee, but also backers and star Jungtae Kim… & even from actor Jung Woo-Sung!